What started out as “just browsing on Petfinder” turned into “the decision of a lifetime,” says Emily Ritchlin. 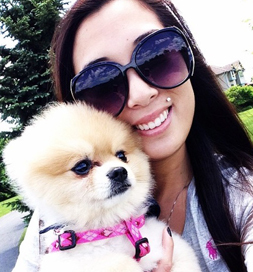 It led to her adoption of Remus, a Pomeranian, who was listed on the website by Furever Friends in Rochester, New York. Remus loves traveling with Emily. That changed when she spotted Remus. “I don’t know why anyone could give him up, but I couldn’t help but get sucked in by his cute little face and knew I had to adopt him.” She set up a meeting. Though he was a little shy at first, from her point of view, he was perfect. She applied to adopt him and spent the next few days getting ready for his homecoming. “I bought toys, a comfy bed, potty pads (just in case–since adjustments can be rough), food and treats,” she says. Now a year later, he is still right by her side, even traveling back and forth from their new home in California to New York from time to time. He makes each of Emily’s days brighter, and she’s glad that her “just browsing” on Petfinder netted her a best friend and the Pomeranian she’d always wanted.